Established in 1964 as a company specialising in repairing construction machinery, wagner is now a modern service provider with a fully equipped workshop, extensive machinery, a highly trained team and a range of service vehicles. 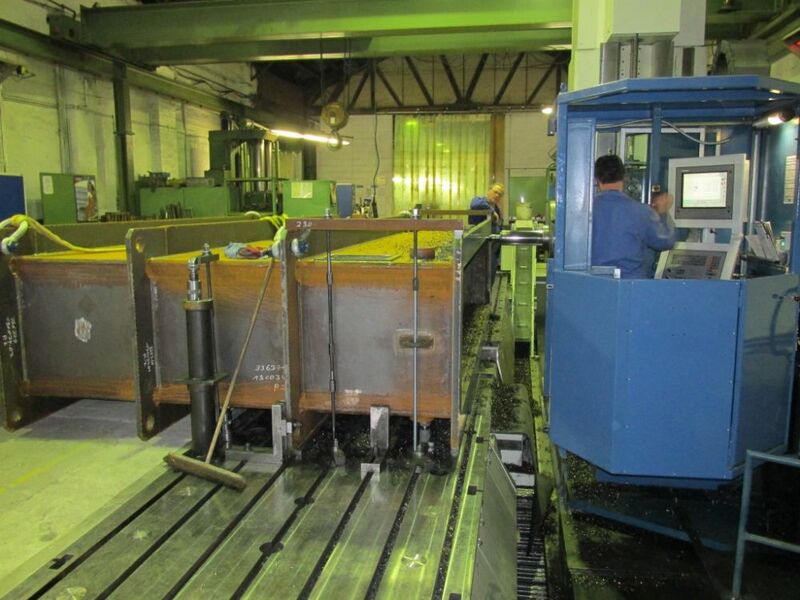 We work in the field of repairing machines and systems in a wide range of areas of industry, particularly in the wind energy sector, including offshore. 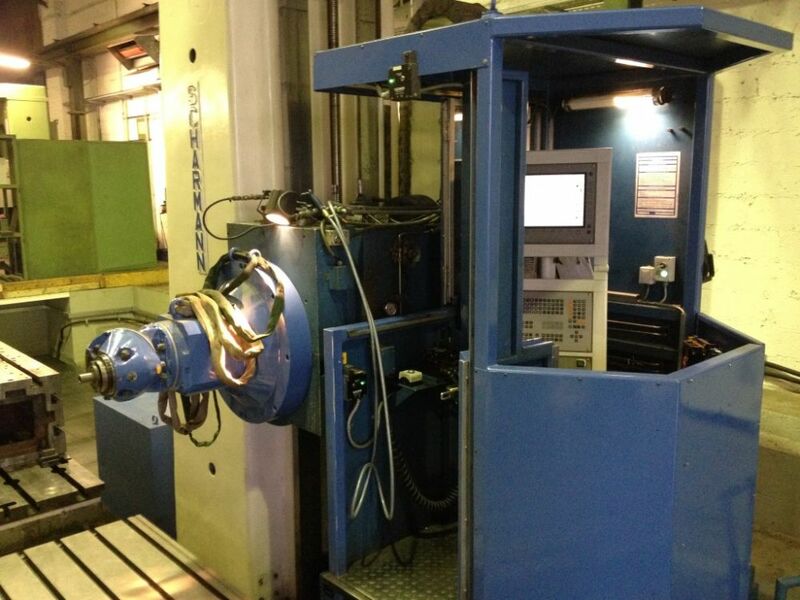 We use our special machines to support us with mobile, on-site machining to carry out repairs worldwide. Changing of the guard at the Aachen Guild of Precision Engineers. The guild has appointed its long-standing Master Tradesman Günter Vogel as its Honorary Guild Master. Stefan Wagner has been chosen as his successor. The board is completed by the Deputy Master Tradesman Gerhard Brülls and Apprentice Master Tradesman Josef Phlippen. We are looking forward to giving you the chance to take our new base in the far north to your hearts as of May 2015. Your contact is Mr. Jens Peve for all aspects of on-site machining, e.g., in shipbuilding or onshore and offshore wind power plants. 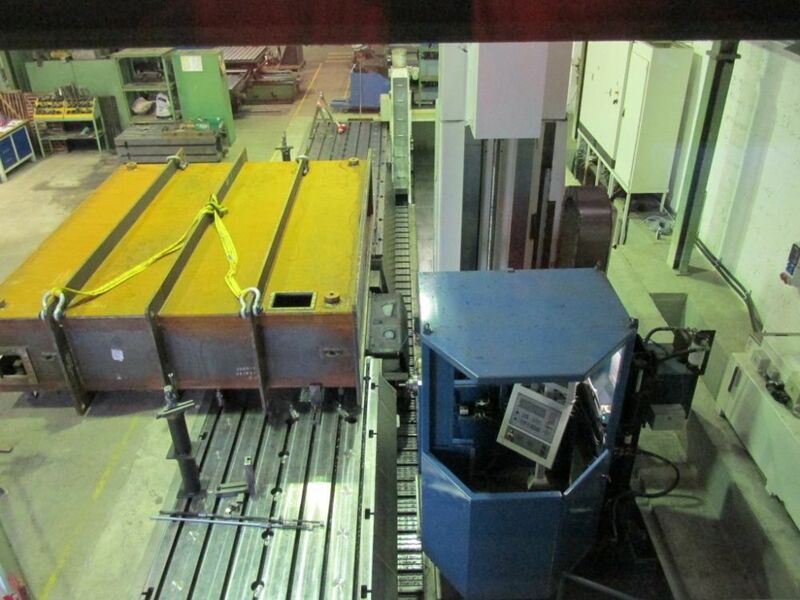 In January 2015, we completed construction of the Scharmann CNC boring mill with Heidenhain control system. We now have the capacity to machine over a range of X=9000 mm and Y=2100 mm at our disposal. As part of European harmonisation, DIN 18800-7 has been replaced by DIN EN 1090. Implementation of DIN EN 1090 took place in our company in October 2014. 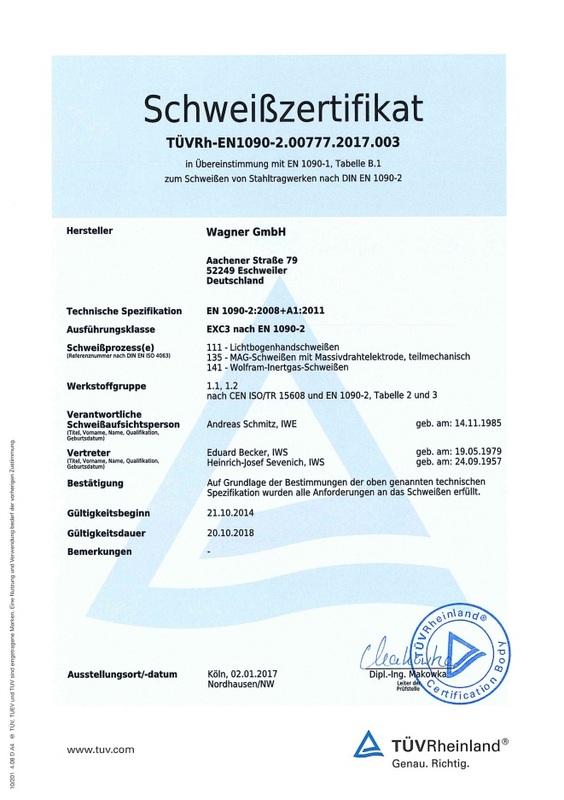 This certificate confirms that all of the regulations concerning the assessment and review of performance consistency described in Annex ZA of the harmonised standard EN 1090-1:2009+A1:2011 are being applied in accordance with System 2+, and that the internal production control system meets all of the requirements it prescribes. 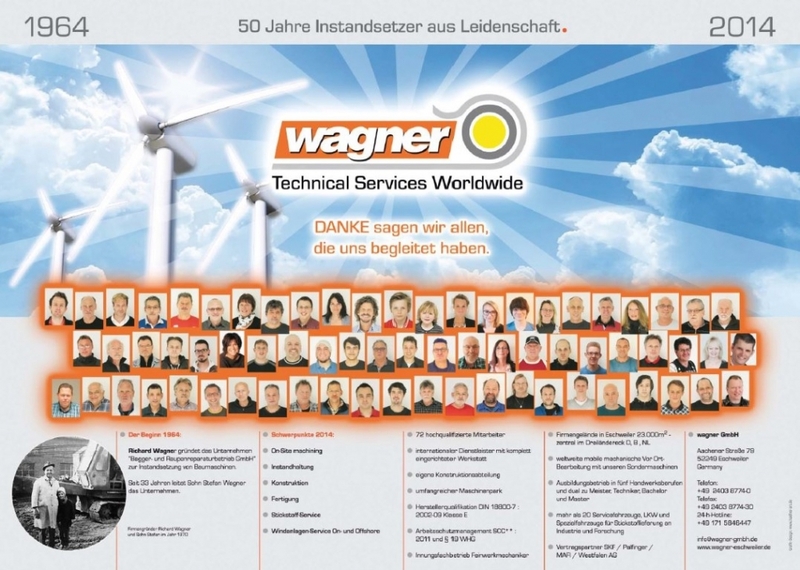 As a way of saying thank you to all Wagner team employees, we have taken out an ad in the local press to mark our 50-year anniversary. 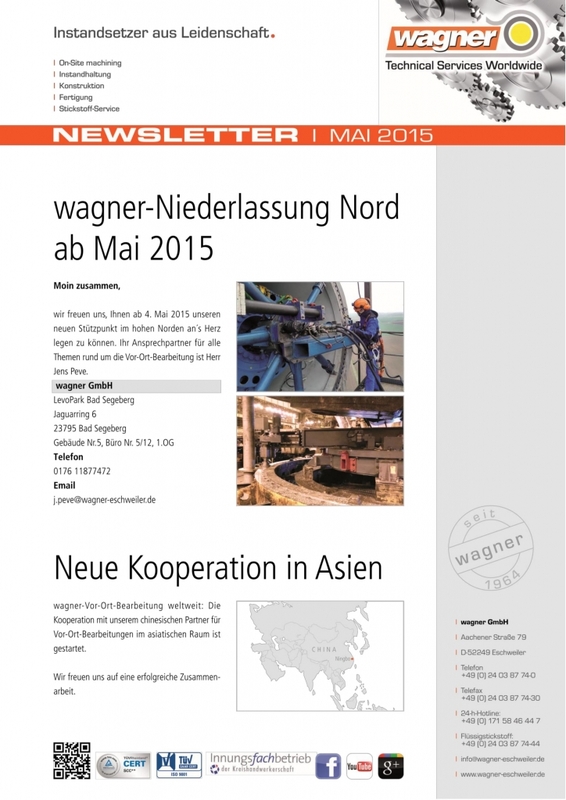 This should also bring the population of Eschweiler closer to our company. We would like to thank all customers for their belief and look forward to continued positive collaboration in the next 50 years! 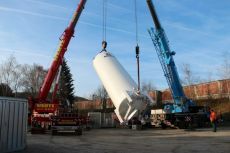 A new tank for liquid nitrogen was installed at the company in February 2014. It has a holding capacity of 42,000 litres. With two service vehicles, we are now even more flexible, and are in a position to further expand our trading area. Shrink fitting, also known as cold shrinking, is the fastest way to create high-strength metal compounds in many applications. The procedure is simple, since it is based on the well-known law of physics that metals shrink when they are cold and expand when they are hot. This principle became economically useful in mechanical engineering thanks to temperature technology. Liquid nitrogen at a temperature of -196°C has proven to be an ideal cooling medium for shrinking metals so that they fit into machines or components. 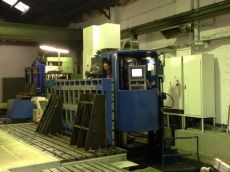 The components are then made to fit perfectly as a result of the subsequent expansion at ambient temperature, with no risk of structural changes, warpage or scaling. We have a modernised assembly area for our Palfinger service available immediately, which means that we can further enhance service and flexibility. We have been an official service agency of Palfinger since 2004. 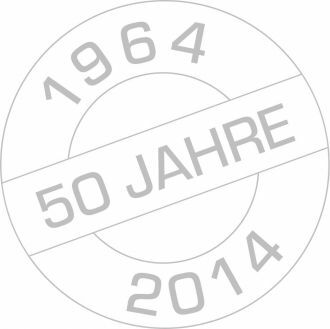 We have been an official service agency of "Lincoln GmbH - Zentralschmierung" now "SKF Lubrication Systems Germany GmbH” since 1994.